K My Name Is Kendra focuses on fifteen-year-old Kendra James' life as it begins to spiral out of control with the return of her long-lost runaway sister Meisha, and the visit of a young celebrity uncle with questionable intentions. Things take a turn for the worse when that uncle exploits Kendra's loneliness and untreated depression and makes a move on her that sends her world into a tailspin from which she's not sure she'll ever recover. Will she survive this tragedy...or will she hit rock-bottom before anyone even notices? 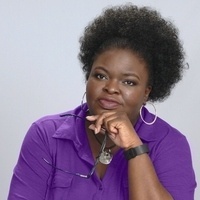 Kamichi Jackson is the author of the Amazon Breakthrough Novel Award semi-finalist YA book K My Name Is Kendra and the upcoming sequel Starring Me As Myself. She has made numerous appearances in support of her work-among them the Baltimore Book Festival. Books will be available for signing after the program.